Today I am going to deliver to you the question I get asked a lot. Are you ready for it? Here it goes, its always a reoccurring question, how late do you knock on doors? How late did YOU knock on doors? How late was your sale? Most people expect to hear an answer of x, y, z time. If you have been following my channel you have probably come to the conclusion that I don’t give one specific answer to a question. I don’t know about you but I personally don’t learn content from a one worded answer. Now, my suggestion to you is that if you take a one worded answer then make sure you try and implement it to see if you will get results. You may get results or you may not. Back to the subject at hand! The time to go door to door knocking may in fact vary! You see it all depends on what you’re doing! Now hear me out! 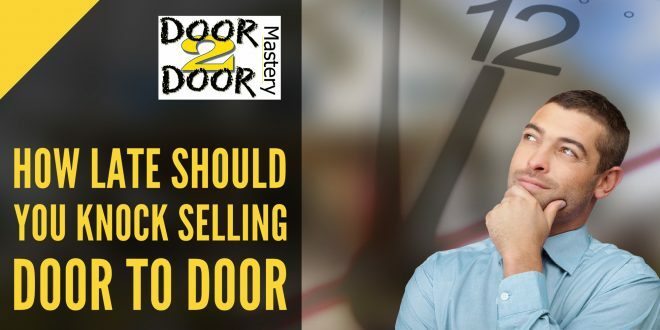 You’re out there on turf probably selling pest control, for example, you want t make sure you are maximizing your door to door sales without leaving to early or leaving too late. Well, get ready for it! You have to take into account what kind of sales you are doing. 1. Are you currently in a summer sales program? 2. Or is it a year-round program? Here is what’s important to note, you are NOT going to be successful or achieve sales if you do NOT have set or targeted specific goals! The goals that you set for yourself have to be a must to achieve. You also must have a reason to achieve these goals. Most of you already know I had to hit a six-figure income a year, which is over a 100000 dollars a year. So how many accounts did I have to sell in order to reach that income? Well back then was a lot different then it is right now! It all depends on what you’re doing! Are you just coasting? Do you own your own business? Are you trying to gain a new clientele? What and how exactly are you selling! What I mean by that is that I had an opportunity to help a salon with there business. They found that offering a low out of pocket cost for pedicures, manicures, and message was extremely rewarding as they went out their door to door. Here is an example, in 4 months you will have one to two months of preselling. Another important note, if you are knocking on doors in the summertime, you are going to want to get out there early! At this point, I usually get the “Paul no one is home in the morning!” I am going to tell you that us humans are notorious for categorizing people doing the same thing, when in fact, it may be just a few, a majority, or it may just be a figment of our imagination. People always tell me that everyone comes home during prime time when there knocking on doors. It disgusts me when people knock on doors based on time! It should in fact be based on goals and what kind of sales you are doing! You have to hit your number! What is your goal? What is it you need? NOT WANT! Also, you have to do the math! Your target number or income has to be calculated. How much sales do you have to make in a day, year, or month to reach it? DO THE MATH!!! Once you do, you will realize the amount of hustle you have to put out there! Now keep in mind, the more clients you approach, the more practice, the better you get and the higher the closing ratio. Once you become an “active” knocker, you begin to get referrals from clientele’s. Summer sales program: You should NOT be out there later than 11 o’clock! 11 you should be at turf! If you want to hit that six-figure income with bonuses and all of that jazz, then you need to start at 11 o’clock. 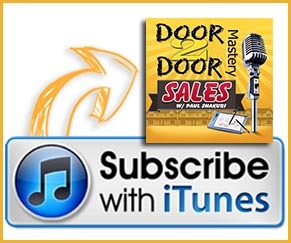 The amount of energy you put at the doors, the number of breaks you take, will, in fact, determine if you are going to be successful at the end of the summer! How late do you stay out? Here is that reoccurring question! Now that I have explained it more in depth, in a summer program it is once it gets dark, plus 1 to 2 hours! Always make sure you stick to the rules around your jurisdiction. I like staying out late to push myself but its also good to stay out late to reach your goals if you haven’t already done so. You have to build that skillset physically and mentally! 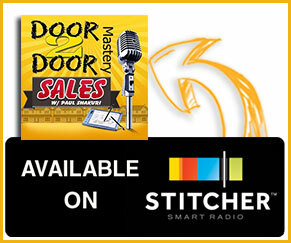 The stronger you become at the doors the more skills you acquire; the more sales you get! By the way, Geoff this content is especially for you! I said I would create it for you! Overall, this answers that reoccurring question! Now my question to you and everyone else, are you going to listen to the information I have just given you and implement it. 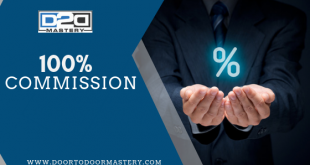 My final advice based on experience is that the year-round sales program is the way to go until you have that cushion, that bank account padded in case of some hard times. Stay safe! Sell ethically! Go out there and knock with utmost passion! Peace until next time!